Can you imagine being 12 years old today and writing a letter to one of the WWE wrestlers and actually hoping for a response? Well, of course, today a 12 year old wouldn’t write a letter; he’d send an e-mail, I suppose. Do any of us actually write letters anymore? 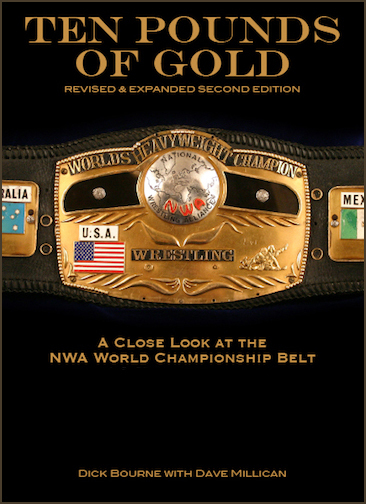 But if, in a grand gesture to an earlier more gentler time, a 12 year old would indeed put pen to paper and write one of his childhood wrestling heroes, what are the odds that same wrestling hero would put pen to paper and write him back? Probably slim to none. 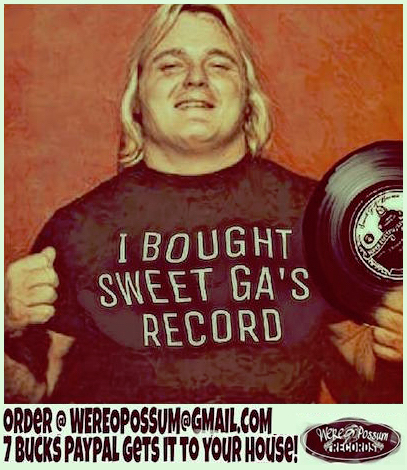 In July of 1975, a young kid by the name of George South was a fanatical wrestling fan who did his best to attend every Monday night wrestling card he could at the old Charlotte Park Center and would never think of missing wrestling on WBTV-3 television every Saturday afternoon. At 12 years old, the only way his grandmother could make him behave was to threaten to not let him do either. 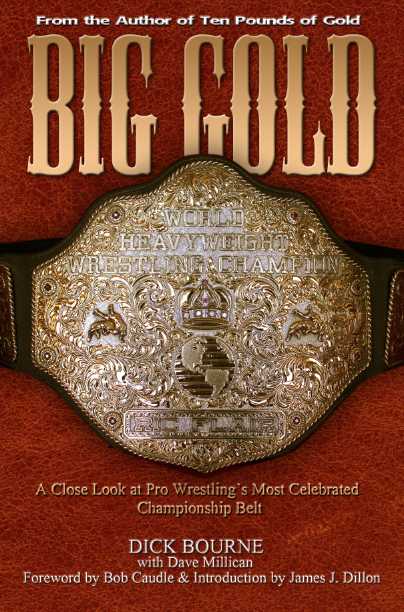 That worked, by and large, and he immersed himself in the wonderful, colorful world of Mid-Atlantic Wrestling and closely followed all the big stars - Paul Jones, Blackjack Mulligan, the Anderson Brothers, “Mr. 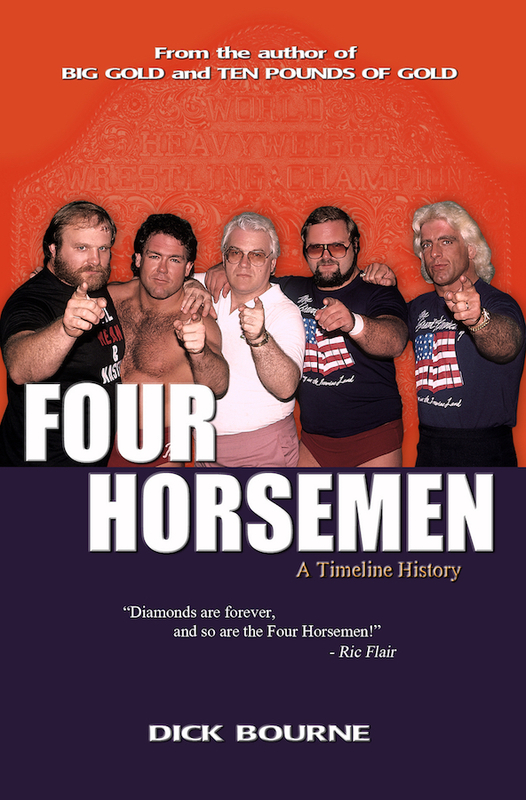 Wrestling” Tim Woods, Wahoo McDaniel, Johnny Valentine, and even a very young Ric Flair. 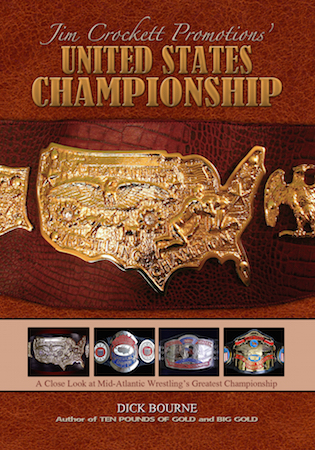 But one of his very favorites was a wrestler who had begun to phase out of his active wrestling career, his matches at the Park Center becoming fewer and far between. This star was a legend in the territory, a wrestler who had main-evented in singles and tag team competition for as long as George could remember. His legend was bigger than life, especially to this young kid who lived every moment for his wrestling heroes. That wrestler’s name was Sandy Scott. Before the Anderson Brothers there were the Scott Brothers. 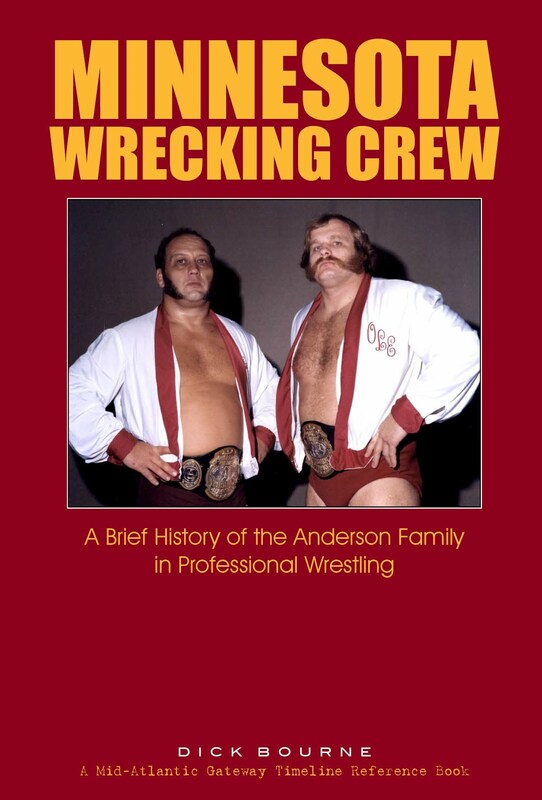 The “flying Scotts” they were called then, Sandy and George Scott, wrestling’s greatest brother tag team at that time, champions in various territories for parts of three decades, and bonafide legends in the Mid-Atlantic territory. 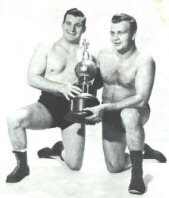 George Scott no longer wrestled, but Sandy had continued his ring career, teaming with other partners like Nelson Royal. 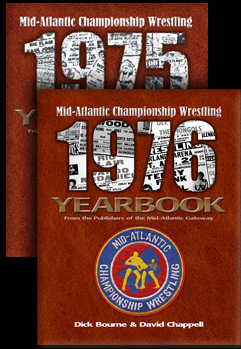 Sandy Scott and Nelson Royal won the Mid-Atlantic Tag Team championships just weeks after George South's 11th birthday. 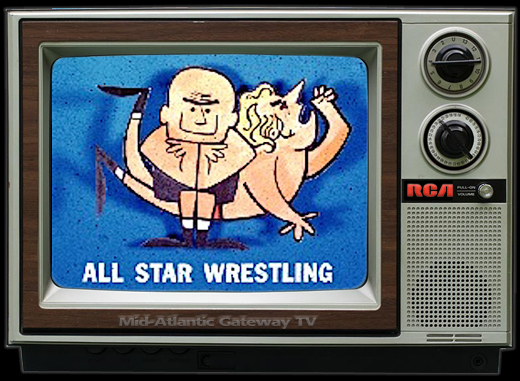 Now at age 12 and out of school for the summer, with a baloney sandwich and a glass of milk, he watched Mid-Atlantic Wrestling every Saturday afternoon, hoping to see Sandy Scott. 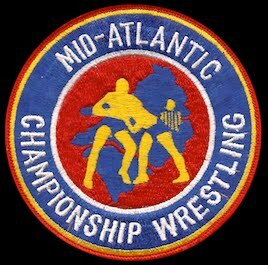 Host Bob Caudle would announce that if fans wanted to write the wrestlers, they could send their letters to the TV station where they taped studio wrestling. He faithfully gave the P.O. Box address in Raleigh each week; it was the same address if you wanted to reserve tickets for the TV matches in Raleigh, too. George knew he would probably never get to go to the tapings; Raleigh seemed a world away to a 12-year old boy. But that wouldn’t prevent him from writing to one of his favorites. 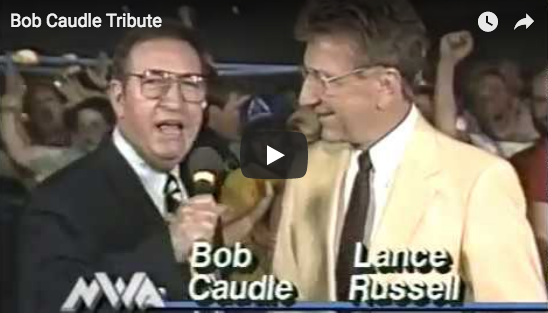 So at Bob Caudle's suggestion on TV, he decided to write Sandy Scott a letter. George sat down at his grandmother’s kitchen table with a pencil and a piece of notebook paper and wrote Sandy the nicest letter he knew how to write. He told Sandy how much he loved him, how much he loved the Scott Brothers team, and how he was Sandy's most loyal fan. George also drew a picture of Sandy, working hard to duplicate what he had seen in a wrestling magazine. George carefully folded the letter and the drawing, slid them into a plain white envelope, applied a 10-cent first class postage stamp, placed the envelope in his grandmother’s mailbox, and raised the red metal flag. It was good to receive your letter and to know you’re such a good fan. I’ll be sure to tell George that you said hello and the nice things you said about us as a tag team. Enclosed you will find a picture that I have autographed for you. Good luck to you. PS – The picture you drew of me was very nice and I enjoyed it very much. It’s hard to imagine today’s superstars taking the time to write fans, if one could even imagine fans caring enough to write the wrestlers to begin with. Wrestling today is just one of many amusements to pass the time, a few hours on Monday night, and not another thought given to it after the show is over. 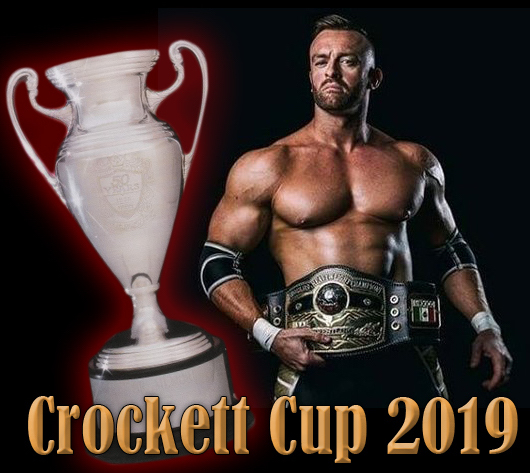 No one is reaching out to make a personal connection, no wrestler is talking you into the local building for the next show in your home town. Today they just hope you’ll tune in the following week, hoping they can pull a good rating. No emphasis is given to filling the seats at the Park Center on a Monday night, or other arenas like it, once the life's blood of the wrestling business. 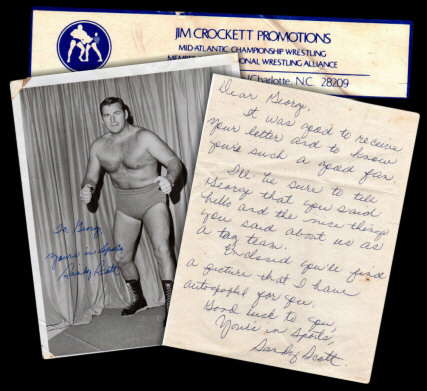 This letter was but one example of the outreach that Jim Crockett Promotions conducted with its fans. Lost is the personal bond between wrestlers and fans, or between a wrestling company and its fans. But that summer in 1975, Sandy Scott had made a 12 year old fan very happy with a short hand-written letter. And that young fan, now in his late 40s, has held on to that letter to this day. Sandy Scott passed away on Thursday March 11, 2010 after a tough fight with pancreatic cancer. The Mid-Atlantic Gateway sends its heartfelt condolences to the family and friends of Sandy Scott. 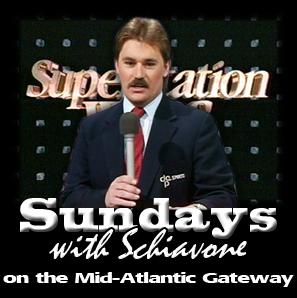 The video tribute above was produced by Thom brewer, a friend of the Mid-Atlantic Gateway, for a tribute show for Sandy in Rocky Mount, Virginia in 2010.